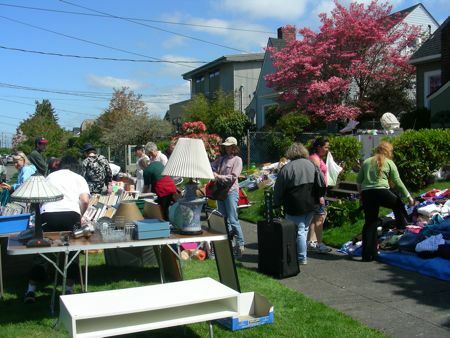 Registration for 2013 West Seattle Community Garage Sale Day starts April 1st! Come back then to find the form link and all the 2013 info – thank you! Just in case you’re wondering. Yes, of course, it’s on. 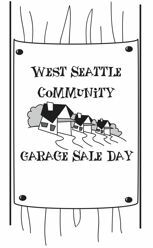 Ninth annual West Seattle Community Garage Sale Day – lots of sales all over the peninsula! – is Saturday, May 11, 2013. Next month we’ll announce the registration dates, usually about six weeks before sale day. Now that it’s Thursday, West Seattle Community Garage Sale Day 2012 is just two days away. Ready to sell and/or shop? Forecast hasn’t changed. This year, the bridges are all open (last year on sale weekend, there was a Viaduct closure, but no problems this time around). All factors are coming together for a great time. Check back here a little later for a few updates to your maps. 250 sales for May 12th, with West Seattle Community Garage Sale Day two weeks away! 230+ sales for May 12, 2012! Last day to sign up for West Seattle Community Garage Sale Day 2012! 11:59 pm today, registration closes, so it’s last call – we are on the brink of 200 sales (a milestone we’ve passed each of the past two years, so this looks like a threepeat) and we’re thinking good thoughts for a WSCGSD that’s as beautiful as the past few Saturdays have been. 9 am-3 pm Saturday, May 12th, is the big day, if you’re just tuning in to this … here’s the form. Yes, we’re doing it again this year! Shop the Shorewood garage sales on June 4th! south end of Shorewood. Keep an eye on shorewoodonthesound.org. Oops, thought we’d had a more recent update here. Just keeping you up to date! P.S. Wednesday night 4/27 is the registration deadline, if you haven’t signed up already. A little more than halfway through the registration period, and we’re up to 110 sales. Be sure to check that you got a confirmation both from us and from PayPal – we have maybe half a dozen people for whom the latter didn’t come through, and that means signup isn’t completed yet (we’ll be pinging those folks within the next few days but it’s still a good idea to check). Almost to 90 sales for West Seattle Community Garage Sale Day 2011! Once again it’s RUMMAGE SALE TIME. Tibbetts United Methodist Women’s Spring Rummage Sale is March 11 and 12, so now is the time to CLEAN HOUSE and BRING THE REULTS TO THE GAME ROOM AS SOON AS POSSIBLE. Work will begin February 22nd & 23rd. Then continue Mondays and Tuesdays after that from 9:00am to 2:00pm, or whatever length of time you can come and help. Come and work for an hour or a day. Coffee and tea will be available at noon so bring your lunch. Come for Fun, Focus and Fellowship. In order to work there has to be RUMMAGE SO PLEASE BRING LOTS OF IT. BUT REMEMBER IF IT DOESN’T WORK FOR YOU…IT WON’T WORK FOR US. So please DON’T bring TVs, computers, broken electrical equipment, chandeliers, ceiling fans, tires, venetian blinds, drapery rods, worn out sofas or chairs, bed springs or mattresses. You can contact Tibbetts through the info you’ll find online at tibbettsumchurch.org. Welcome to 2011! Just four and a half months till WSCGSD! Just a top-of-page note to make sure you know, if this is the information you are looking for, that West Seattle Community Garage Sale Day this year will still be the second Saturday in May – but that’s MAY 14, 2011, this time around! Multi-garage-sale neighborhood events coming up in Shorewood and Capitol Hill! This Saturday, June 5, 10 am-4 pm, it’s Shorewood on the Sound’s Streets of Sales day – dozens of sales, we are told. Here’s a bit more from our White Center Now site – we’re awaiting more word from the Shorewood folks on how to get their map, which we’re told is not available so far online. 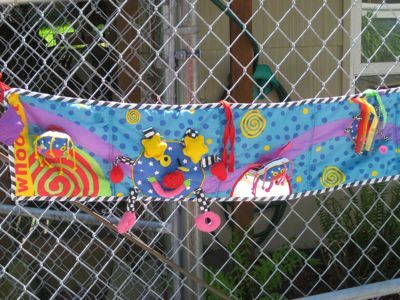 Saturday is also Capitol Hill Community Garage Sale Day, starting at 10 am – more at capitolhillgaragesale.com. Click! 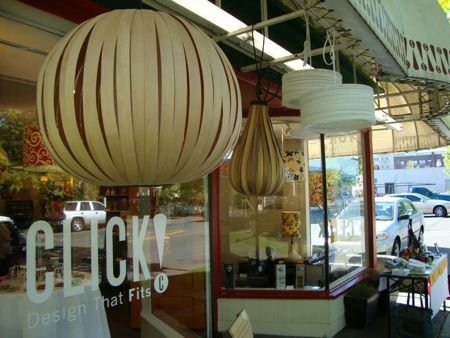 Design That Fits is one of the businesses participating in this year’s West Seattle Community Garage Sale Day – co-proprietor John Smersh shared this photo via Facebook, noting half-price lighting is part of their sale. Also check out their handbags, and more. Sales 105 and 149 have now canceled because of last-minute problems – we can’t take them off the printable map but if you have already printed yours, please scratch them off – we HAVE deleted them off the Google Map, which will continue to be updated as needed up till sale day. That still leaves not only 198 sale locations BUT also hundreds more sellers through the group sites. Coming later today: School sales in the spotlight! P.S. Weather looks good for Saturday – “partly sunny” ! Fabulous girls, almost new, Beach Cruiser…just in time for the warm weather! Funky vintage women’s shag rug coat! Cook books (many signed by the authors). Hot dog sale to benefit a mission trip through West Seattle Christian Church plus 7 tables full of items, way too many to list! Animals First Foundation will be selling new pet toys and will also be accepting household donations at their space beginning at 7:30am. Lots of pet items mostly new, skis & photography. Look for Todd’s spot; he is donating 25 percent of all pet items is going to Furry Faces Foundation. Northwest Center Items nice woman’s clothing, clothing accessories, woman’s shoes, boots, purses, bags, bedding, linens, arts and crafts stuff, household items, blender, coffee maker, camera, jewelry, art work, wall hangings, frames, vases, keyboard crate amp, kenwood car speakers, cd burner, various holiday decorations & lights, a pair of skis, poles, and boots some free stuff. Furry Faces Foundation will have organic veggies and Tomatoes, plus ornamental grasses; annuals such as pansies, coleus, dianthus, etc. ; and perennials, such as Columbine, Lychnis, Solomon’s Seal, and geraniums. SWS BPW = SouthWest Seattle Business & Professional Women Business and Professional Women’s (BPW) Foundation is partnering to create successful workplaces by focusing on issues that impact women, their families and employers. Successful Workplaces are those that embrace and practice diversity, equity and work-life balance. Items for sale will help us fund our scholarship efforts. Mixed Bay Designs are a great Mothers Day gift item. Eco Chic Reusable Bags. Go green in style with these very chic designer reusable bags! Take them everywhere. Sugar, peanut butter and chocolate chip cookies for the Climb to Fight Breast Cancer, which is a fundraiser for Fred Hutchinson Cancer Research Center. We are climbing Mt. Rainier in August and need to raise $5,000. We’re about half way now, so still need $2,500 to go. Proceeds from the cookie sale benefit breast cancer research at the Hutchinson Center! Highland Park Improvement Club and C and P Coffee are other group sites. And … more than 200 sales for 2010 West Seattle Community Garage Sale Day! We continue tallying them with the help of the database from the form-providing software we’re using, and we’ve definitely passed 200. In the throes of mapmaking right now. Remember that if you need to cancel – hope not! – you have to let us know by THIS THURSDAY because the map will go to the printer on Friday and will be available online by Saturday night. We are checking this site for comments but the best way to reach us with questions or cancellations is to e-mail garagesale@westseattleblog.com OR give us a call at the West Seattle Blog 24-hour business/news line, 206-293-6302. Thanks again for participating!!!! 200 sales for the sixth annual WSCGSD! We’ve done an almost-final (pending cancellations) count, and 200 sales are what we’re seeing on the list – thanks for all the enthusiasm! We’ll be posting nightly updates with some highlights, here as well as at WSB and on Facebook (see the link in the right sidebar) – stand by! Just making a note of it. Looks like we’ll run things a lot like last year – with registration starting a month in advance, which means early April. Stay tuned! And “fan” the WSCGSD page on Facebook. We’re almost at the T-minus-three-months mark. Still on for May 8, 2010. Stand by for news! Got some extra prizes so may have extra winners! Hopefully will be announcing on Wednesday. Things post-Sale Day just got a little busy. Thanks for your patience, and thanks to the folks who entered! *Today’s the deadline for sending in your pix for the contests – Most Creative Sign, Most Unusual Item Bought, Most Unusual Item Sold. garagesale@westseattleblog.com by end of day today. *The Seattle Weekly has published a slideshow of people and their finds, encountered during Garage Sale Day – see it here.